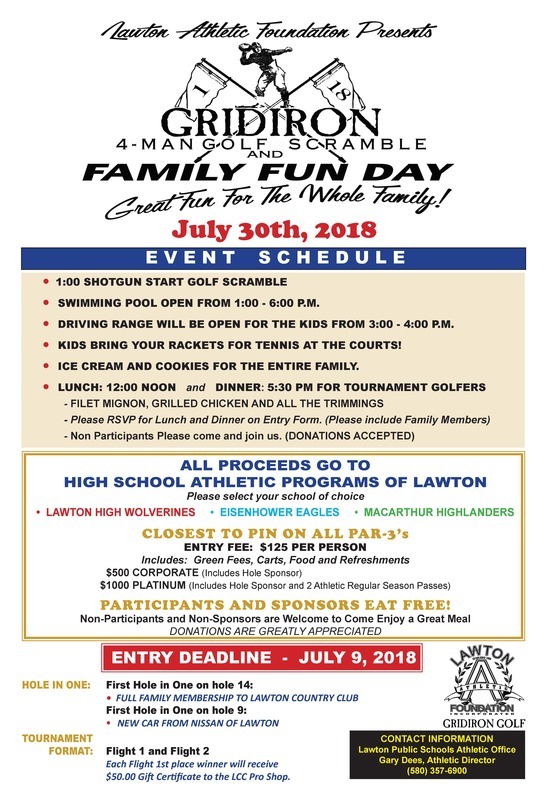 Mark your calendar for the Annual Gridiron 4-Man Golf Scramble and Family Fun Day July 30th at the Lawton Country Club! • SWIMMING POOL OPEN FROM 1:00 - 6:00 P.M.
• DRIVING RANGE WILL BE OPEN FOR THE KIDS FROM 3:00 - 4:00 P.M.
• KIDS BRING YOUR RACKETS FOR TENNIS AT THE COURTS! • ICE CREAM AND COOKIES FOR THE ENTIRE FAMILY. For more information, contact LPS Athletic Director Gary Dees at 580-357-6900.